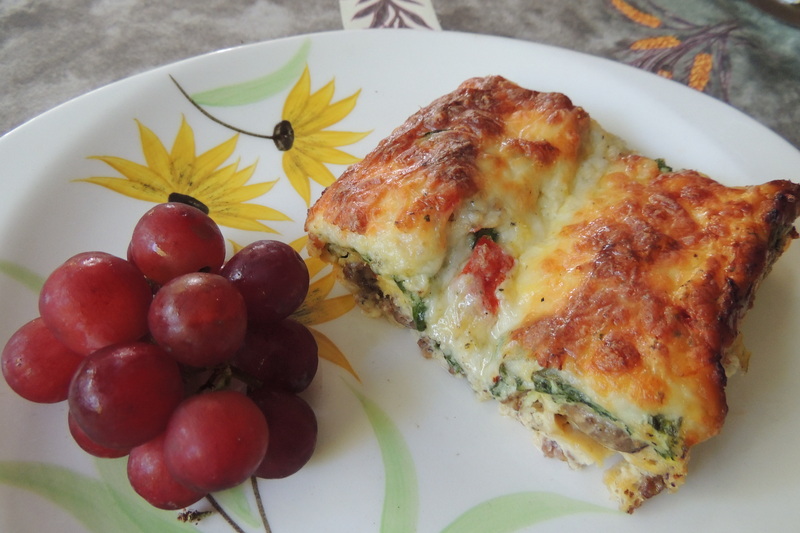 Perfect for low-carb diets, this easier version of “Quiche Primavera” (see Aug 2013 post) eliminates the crust and adds flavor from spicy sausage, mustard, and italian herbs. For a meal in itself, add fresh fruit and maybe a sweet muffin to contrast with the spicy casserole. Fits nicely in a baking pan 11 X 14 to serve eight. Lightly spray 11 X 14 baking pan with cooking oil. Saute crumbled sausage with mushrooms and onions until sausage is no longer pink and onions are translucent. Add to pan and layer with spinach, tomatoes, herbs, & mozzarella (in that order). Beat 16 eggs with mustard, skim milk, Bisquick, salt & pepper. Pour over, cover, and refrigerate overnight. Bake uncovered at 350 degrees for 45 – 55 minutes until top is lightly browned and center is just set. Do not overbake. Cut into eight portions and serve. ← Banana Chocolate Oatmeal Buckwheat Buttermilk Muffins!! !